The Short-eared Owl is probably the bird of the moment. As has been said many times before, it looks like a particularly good year for them. Down at Papercourt Meadows near Woking, two Short-eared Owls have been seen regularly for the past couple of weeks. With luck they may stick round for a while. The habitat at Papercourt is ideal for them. I've paid a couple of visits during the past week. Last Sunday's trip was a bit of a disappointment. Leaving the house in bright sunshine, I was hopeful I'd get some good late afternoon views, but ten miles down the road past the Leatherhead junction of the M25, the weather changed dramatically. A thick fog descended - it was a real pea-souper. By the time I'd arrived at Papercourt, visibility was down to 50 yards. 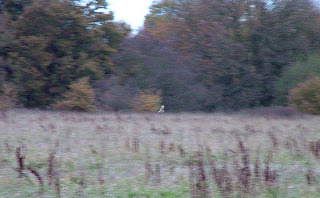 I did see a Short-eared Owl appear out of the gloom - it landed on a fence post before setting off across the Meadows but I couldn't get my camera to focus on to the bird because it was too misty. I opted to visit the area again this afternoon. I have been tempted to try and find a Firecrest that has been seen regularly at Mercer's Lake car park during the past few days - just a mile up the road - and failing a sighting there a trip to Banstead Golf Course, where David Campbell had recently relocated a regular Firecrest visitor. But I don't have a good relationship with Firecrests. My success rate this year has been nil - and I've tried umpteen times to see one. I'm not sure why it is, but part of me thinks it's to do with my hearing, which after many years of being subjected to very loud motorsport, has probably suffered irreparable damage and so I probably can't detect high-pitched sounds - like those made by a Firecrest. They are also extremely fidgety little birds, so getting a nice view of one is hard work. So, wanting a relaxing late afternoon after a very busy week, I decided Firecrests can wait. Down at Papercourt there were, thankfully, few people about apart from a number of birders and a couple of horse riders. While I waited I saw a Kestrel and a pair of Stonechats. 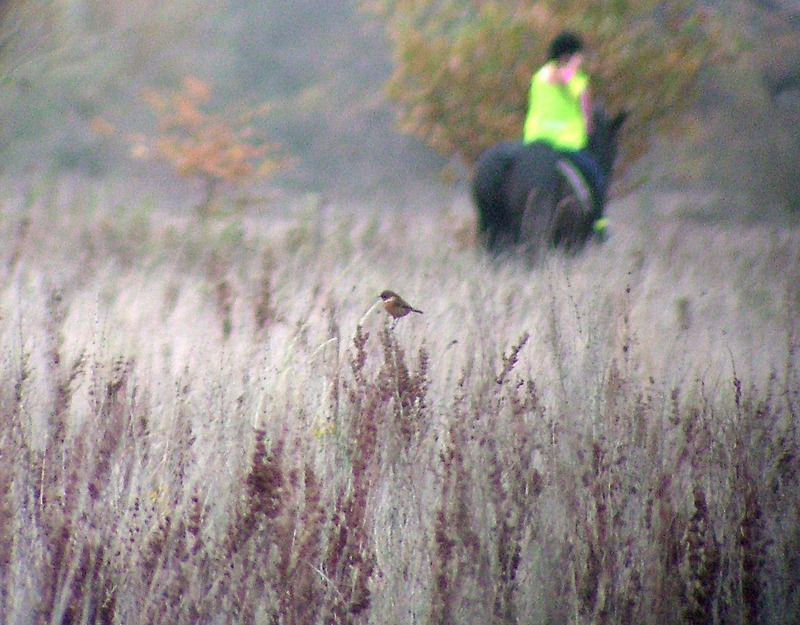 By 3.30pm the first Short-eared Owl appeared. A bit distant but it quartered the usual area to the north-west of Papercourt Lock for a good 15 minutes. At one point it was hassled by a crow before it managed to shake it off to continue its hunt. 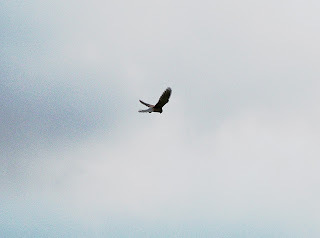 Eventually, it flew off heading north west. About 20 minutes later a second one appeared from the east and carried on where the first had left off. By this stage the Barn Owl was going through its evening routine. There had earlier been a couple of large birds in the distance being mobbed by crows, one might have been the Barn Owl, but it was getting dark and hard to make out what they were. On the Surrey Birders website Steve Chastell posted he had seen three Short-eared Owls at Papercourt this evening and possibly a fourth. Here's hoping so. Great info but I am having trouble working out where to park and where to walk in order to find the Meadows, a grid refor two would be great, thanks. Best place is to park in car park next to the mini-roundabout in Old Woking at TQ018569. It's at the junction with the High Street and Broadmead Road. Walk back down Broadmead Road for 200 yards (over a small bridge) towards Send and after the last house on the left enter Broadmead Field via the public footpath sign. On your right as you walk you will see an old WWII pillar box - keep on walking round the path for about 400 yards. All this area around the pylons is good for watching the Short-eared Owls. Walk further on and you should see the Barn Owl quartering the Meadows to the north. Brilliant thanks, I parked in there today and asked a local for directions, didn't have a clue what I was talking about ! Many thaks for your help. Have walked my dogs there for 20 years and to be honest findng all these bird watches quite funny to watch. One request though. If you are going to set up cameras etc, don't do it in the middle of footpaths, and please don't look at those of us not interested in the owls as if we are something you just stepped in.